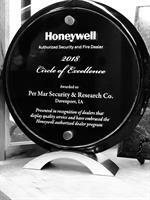 DAVENPORT, Iowa- Per Mar Security Services, a leading provider of total security solutions for residential and commercial clients based in Davenport, IA, received the “Honeywell Circle of Excellence” award in 2018. The award is given to the dealers who show a true commitment to Honeywell Intrusion, Video, Access and Fire, plus the authorized dealer program, and have also achieved total year-over-year growth and are active participants in the program. The dealers recognized constantly go above-and-beyond.